Procion is perfect for natural plant fibers — cotton, linen, paper, reeds, and wood. Do not use it to dye synthetics. 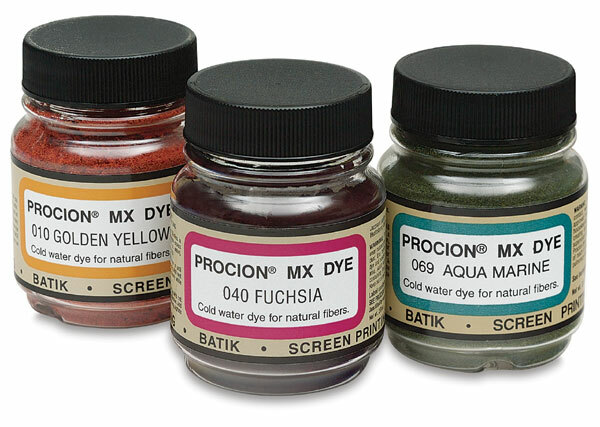 Use Procion for tie-dye, vat dyeing, batik, airbrush, handpainting, printing, spatter-painting and more! This concentrated dye, which you add to hot water, gives you the most brilliant color of all dyes. Typically, 1 oz can dye more than 5 yards of fabric or about nine T-shirts. Click on the Resources tab for more information and detailed instruction sheets. Each bottle contains 2/3 oz (19 ml). Jacquard Urea can also be used to enhance color. Starter Set — Great for beginners, this set contains 4, 2/3 oz (20 ml) jars of dye including Fuchsia, Lemon Yellow, Jet Black, and Turquoise plus a 1 lb package of Soda Ash Dye Fixer. 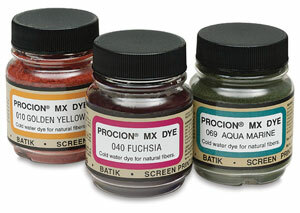 Procion MX dyes can be used for a variety of projects. Additional information and complete instructions are available. Click on a link below to download the PDF. Adobe Acrobat Reader is required.